Churches are divine places, as expected to be. These are places where people render worship to their maker. It definitely has to be of perhaps an excellent standard, say as Godlike as perfect. No matter how remote the place, there is always a church somewhere for the people. One stunning thing about churches is the out of the world aesthetics they come with, perhaps the designers get the divine inspiration to know what will be befitting. You can only appreciate their structure and architecture if you have a sharp and heightened sense of appeal. Church designs usually come with some uncommon cryptic details of belief; time past and their style of representation; archetypal features- towers and detailed/arched windows, or the statues in the surrounding of the church. Churches, especially those of the Roman Catholic are known for the preservation of tradition as seen in their choice of architecture. It might not be as exotic as expected but it sure does say something about the church itself, its location or the circumstances surrounding the erection of the building. The first point of attraction that hits you is the sharp exterior decor of the cathedral- maroon red and white striped tiles. This is the headquarter of the Roman Catholic Community in Cotonou. This Gorgeous architecture has survived and existed for over a hundred years. Cotonou Cathedral is an elegant and captivating beauty. St Joseph’s catholic cathedral is a tourist site in Zanzibar, a hundred and seventeen(117) years old and still functional. The church was built during the colonial era by the French missionaries between 1893 and 1898. The location of the church is an attraction of its own; the stone town, a UN world heritage site where some historical buildings are also harbored. It is an ancient but a major city in Zanzibar. Located in the capital of Libya; Algeria/Elgazayer Square. Owing to the Italian roots of the architects involved in the construction of the cathedral, the building is a typical piece of the Imperial Roman Architecture. This Tripoli Cathedral has survived a multiple of decades, however, it was more functional in the 60’s. In the year 2000, the site was turned into a mosque. The Cathedral of St Catherine of Alexandria has been in existence and functional since 1832. It was constructed and dedicated to St Catherine, the Alexandrian patron saint. She was martyred for her refusal to compromise her faith in God and her feast day is on the 25th November, every year. The cathedral has an exceptionally beautiful interior when the chandeliers are on. Members of this church have created a niche for themselves; they are generally known for rendering charitable manual services for the development and beauty of the community. This Madagascar Cathedral is located in Ambavalao, a beautiful ancient city with incredible landscapes. Ambavalao Cathedral has beautiful brick designs on the exterior; a tower and subtle colored arched windows. Near to the church is the Anja natural reserves- a place to enjoy nature to the core. Ambavalao is a city of plateaus; with a kiss of the sunlight on the highlands and the buildings there, Ambavalao is an undeniable beauty. The exterior of St Joseph’s Cathedral is an amazing site to sit out and relax in the twilight. The building co-exists with a 200 feet tower, a convent, a monastery and a school. St Joseph is found in the city center of Asmara; built in 1922 by the imperial authorities and consecrated the same year. Built under the Portuguese rule; restored in 1748 and also dedicated to Our Lady of Populo, the Portuguese church is a simply ornate architecture with two towers and stained glass windows. By extension, the church has a cathedral and a chapel attached to it. The church is a national monument, located in the serene environment of Benguela. The Church of Our Lady of Victory was built in 1919, during the reign of the Spanish Protectorate of Morocco (1912-56); and located in the Spanish expansion area of Tetuan, in the Rif mountains of Northern Morocco; indeed a beautiful scenery. The town’s architecture, the church inclusive has a heavy reflection of the Moorish arts and style. Located in the capital of Madagascar and the largest city in the country. The church is legendary and remembered for the executions of Christians during the reign of Ranavalona I, the “mad queen” in the 1800s. The church was built on a cliff, from where she made her executions a public show. The present day structure has a beautiful statue of Mary right between the two towers of the church building. According to the Rwandan national Census of 2002, about 56.9% of the Rwanda’s population is Roman Catholic. Thus , the Parish catholic church is one of the numerous churches in Rwanda, a country with an ugly religious history with after effects that has lingered on for several years, almost a couple of decades and counting. Th Parish church is located in Rwamagana, the Eastern Province of Rwanda. The St Louis cathedral was built on the dilapidated debris of the ancient temple to the Punic god of healing, Eshmun. The simple but stunning architecture was structured after the Gothic and Byzantine styles and took 6 years to build (1884-1890). Huge financial contributions from royalties and philanthropists was plundered into the erection o this holy house. The interior of the building has a cross shape of 65m by 30m. It was consecrated with inexplicable grandiose in the presence of top personalities and clerics in the church. The Dutch Reformed Church (DRC) of South Africa was built in the 17th century when the Dutch arrived the country. They built it as a replica of the Dutch church in the Netherlands. They did this alongside other strategies to teach the African converts their theology. Jan van Riebeeck officially oversaw the erection of the church in 1652. 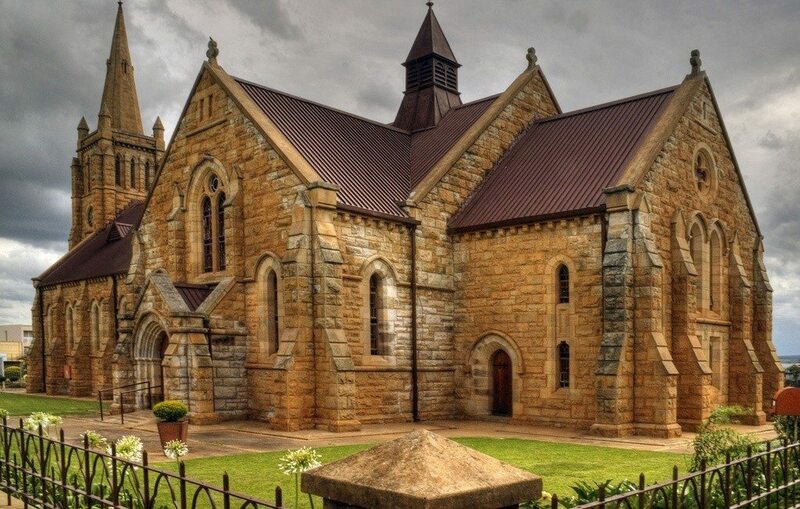 The Dutch Reformed Church which is a popular world heritage site is located in Vryheid (which means freedom), KwaZulu-Natal, South Africa.